(Hartford, CT) Dunkin’ Donuts Park will host the defending champions Wareham Gatemen as they take on the well-established Yarmouth-Dennis Red Sox on July 23, first pitch scheduled for 12:30 pm. 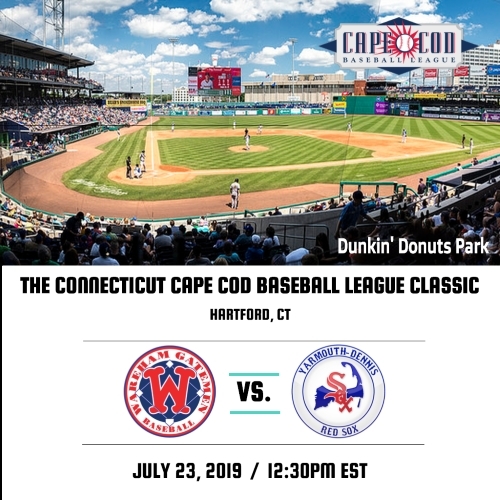 This is the second year the Cape Cod baseball league has traveled to Connecticut to play this matchup. Last year the YD Red Sox got the victory over the Wareham Gatemen 5-0. This will be a tremendous event for both clubhouses to play in this professional-like atmosphere. Dunkin’ Donuts Park opened up in April of 2017. It is known as one of the Minor leagues most prestigious ballparks in the country. With a stadium size of 6,850, the fans, as well as the players, will be exposed to a phenomenal minor league stadium and facility. "Playing at any minor league stadium is always exciting but going back and playing at Dunkin Donuts Park for a second year is a thrill. It is an experience that the players as well as our coaches enjoy and with Jerry as the Yard Goats former manager makes it even more special. We are extremely thankful that the Yard Goats were willing to have us return and that the Y-D Red Sox were willing to participate in the game again this summer. Our hope is that this game will become a Cape League tradition... its already a Gatemen tradition" - Andrew Lang, General Manager of the Wareham Gatemen. The Cape Cod baseball league was established in 1885. It is the top summer destination for the best collegiate Division 1 baseball players in the country. From June to August the top collegiate players go to Cape Cod to showcase their talents to the MLB scout and fans. The league is composed of ten teams all located on Cape Cod.